Graphic design history often reports the introduction of the Apple Macintosh predominantly as a sudden occurrence that inevitably led to a new design attitude and aesthetics. What if, instead, we consider that event not so much as the beginning of a revolution but, instead, as one stage in a longer process of transition towards computer-aided design? Focusing on the Netherlands, this paper articulates that designers were already influenced by computer technology in previous decades and that the attitude towards this new tool developed over time, as shown by a comparison of the work of such designers as Wim Crouwel – who was inspired by the new digital technology and designs – with that of Ootje Oxenaar, Peter Struycken and Jurriaan Schrofer, who experimented with the computer as an automated production aid. The main focus of the paper is however on the story of the Aesthedes computer – a remarkable design computer put into operation shortly before the launch of the user-friendly Apple Macintosh – and of its adoption at the Total Design agency in the early 1980s. The brief existence of the Aesthedes helps to illuminate different stages of graphic designers’ conception of and approach to the computer: from a quintessentially modern phenomenon and source of inspiration and, later, an industrial tool to automate traditional design work, to the medium that allows designers to express their ideas. It is usually reported that the arrival of the Apple Macintosh in 1984 brought about a fundamental change in the field of graphic design: in a short period of time the computer became an indispensable part of the design practice and was incorporated in the creative design process, as well as in the production process, while the screen and computation progressively revealed to be more than just a tool, a “liberating medium of a new graphic sensibility” (Poynor, 2003, p. 95). Even before the advent of the Macintosh, however, the computer entered the minds, the practice and the offices of designers – receiving both enthusiasm and resistance. Computerized or digital design has in fact a longer and richer history, which deserves to be investigated if we want to gain a more accurate understanding of designers’ attitudes towards and relationship with technology, of how these evolved and eventually transformed the practice. The concept of “designing with the computer” has been approached in various ways prior to the launch of the first desktop computer and the question arises as to which point the computer really becomes part of the design process and in what way this came about. This article deals with a piece of this history from the Netherlands: it tells the story of the Aesthedes graphics computer – developed by the Dutch company Claessens Product Consultants – and of its adoption by the graphic design office Total Design in the early 1980s. Set against the backdrop of the engagement of several Dutch graphic designers with the computer between the 1970s and 1980s – designers like Wim Crouwel, Ootje Oxenaar, Peter Struycken and Jurriaan Schrofer, who shared an interest in the new technology but showed different attitudes towards it – and discussed in relation to the later advent of the easy-to-use desktop computer from the Silicon Valley, this story helps to shed a light on the evolution of graphic designers’ approach to and conception of the computer: from a quintessentially modern phenomenon and source of inspiration and, later, an industrial tool to automate traditional design work, to as the medium that allows designers to express their ideas. In the 1960s and 1970s computers were still large pieces of equipment operated by specially trained people: not available to the general public, they were mainly used by large industries and universities. The printing and the telecommunication industries were among the first sectors where mainframes made their way and where designers could meet with the computer. At the time, therefore, the computer could not only be an inspiration for designers but become an actual production tool, challenging their conception and methods. 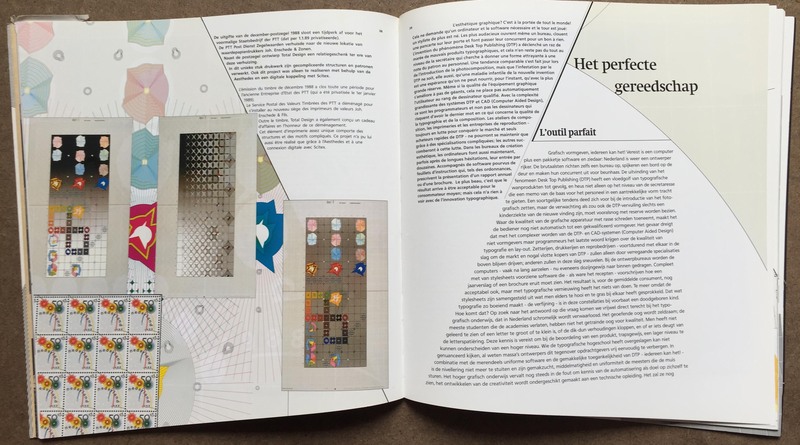 In Dutch literature on design history a few examples are mentioned of graphic designers who – prior to the launch of the Apple Macintosh – involved the computer in the design process. These were all designers who, thanks to their reputation and position, could build their own opportunity to explore the new technology and experiment with it. All of them shared the idea that the computer reflected the coming of a new era – the shift from the industrial age to the information age – and it should be considered as a modern phenomenon. 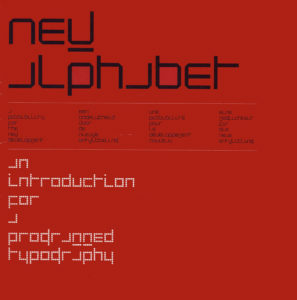 One of the first examples of graphic design inspired by computer technology is Wim Crouwel’s New Alphabet (figure 1). Crouwel started working on this typeface in 1966 after having seen how poorly a new digital typesetting machine, the Digiset by German manufacturer Hell, handled traditional letters. 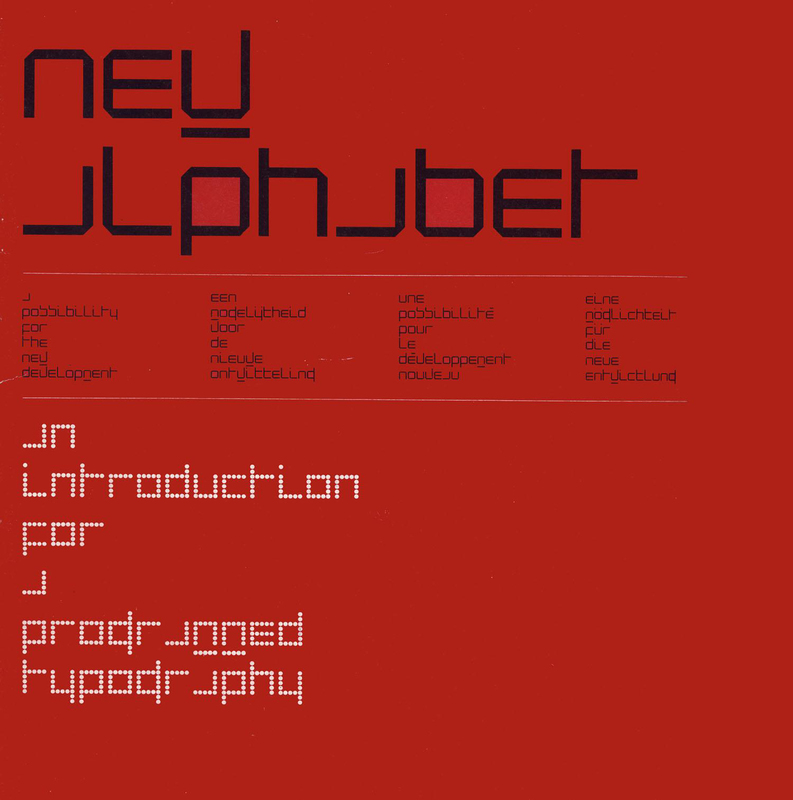 He took on the challenge of designing a typeface that would better suit the requirements of contemporary technological possibilities, and particularly to that of the cathode-ray tube technology used in the photo-typesetting process. Letters needed simplifying in order to remain dimensionally stable. In order to achieve this, Crouwel constructed a system of horizontal and vertical lines in a grid. Fig. 1 – Wim Crouwel, Kwadraatblad New Alphabet. Steendrukkerij De Jong en Co. 1967 / © Wim Crouwel, Amsterdam. Crouwel was well informed on the latest technological developments via one of his clients, IBM. He was captivated by technology and recalls how he “devoured information” about electronical lay-out machines from the USA. Along this path in his early years at Total Design he began experimenting with test set-ups to project layouts on a screen he had heard about. His idea – as he reported in a conversation – was “to project a grid using one projector and to project pictures on top of it using a second projector, and then to photograph the image” with the aim of simplifying the layout process. Other designers in the Netherlands who had the opportunity to deal with computers in the 1970s and early 1980s were those involved in the design of postage stamps. Robert Deodaat Emile (Ootje) Oxenaar was one of them. In 1970 he designed a set of five summer stamps (figure 2), commissioned by the PTT (Dutch Postal Service), the state-owned company for Dutch post and telecommunications, which were greeted at the time as the first-ever digitally designed postage stamp. This view of the event was actually based on a misunderstanding as Oxenaar admitted later (Middendorp, 2002, p. 120). The design was in fact made by hand; execution only was carried out with an electronic drawing machine, the Coragraaf DC, which was then in use at the Technical University of Eindhoven. Together with computer scientists from this institution Oxenaar experimented with the use of a computer-driven drawing arm for the reproduction of the complexe line drawings in the composition. This kind of design made of complex geometric patterns could only be reproduced by a programmed drawing device. Even though the potential offered by automation was apparent, not all designers were ready to depart from hand work. A fellow designer of Oxenaar, Jurriaan Schrofer, who also used complex patterns and structures in some of his designs, was given the opportunity to experiment with the Coragraaf at the Joh. Enschedé printing house (Huygen, 2013) which also possessed a Coragraaf machine. This printing house specialised in printing stamps, banknotes and other security documents. The drawing machine enabled Schrofer to find a technological solution for the intricate letter figures (figure 3) he designed for the Rijkspostspaarbank (the Dutch post office savings bank) in 1970. However, while he recognised the possibilities of the computer, he eventually preferred to continue drawing his complex patterns and structures by hand (Huygen 2013, p. 353). As for Oxenaar, he also proved to be an advocate of computer technology when he – then as head of the department of Aesthetic Design for the PTT – favored the design that Peter Struycken submitted, in competition with other designers, for the the new stamp of Queen Beatrix. To produce this design, Struycken worked closely together with the department of pattern recognition at the Technical University of Delft to adapt a specialized computer programme for the translation of the Queen’s portrait to the smallest possible amount of grid points. Even though the board of the PTT and Queen Beatrix herself preferred other designs, Oxenaar succeeded in persuading them to elect Struycken’s stamp which, according to him, was “modern” and should be regarded a proper “symbol of its time”. Fig. 2 – R.D.E. Oxenaar, design summer stamp, 1970 / Courtesy Museum voor Communicatie, Den Haag. Fig. 3 – Jurriaan Schrofer, annual report 1969, Rijkspostspaarbank 1970 / Courtesy Wim Crouwel Institute, Amsterdam. 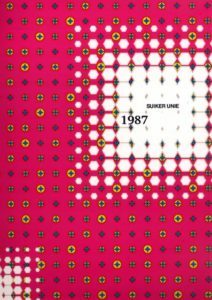 These examples from the 1970s and early 1980s tell how during this early period a number of practicing designers were already fascinated with technological innovation and regarded the computer as a quintessentially modern phenomenon. Wim Crouwel, who still describes himself as a techno-freak, was inspired to create a new visual language by his encounter with technical devices and his expectations of the digital possibilities that came with them. The New Alphabet, however, was still the result of a traditional handwork. In the case of Oxenaar, Struycken and Schrofer the computer devices were not only inspiring phenomena but also useful tools in the execution of complex tasks. The implementation they made of the use of the computer technology, though, was often limited to the occasional project and encouraged by their commissioner. In none of these cases did the designer involved either have access to, or the possibility of, creating an original design on a computer. Although used in an experimental way, the computer functioned as an aid to facilitate the automation and reproduction of complex visual concepts that were created by hand. 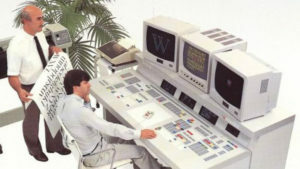 The availability of automated workstations for professional use during the late 1970s marked a shift in the approach to the use of the computer. While the individual fascination for technology remained a driving force for designers in their motivation to investigate the possibilities of computers, the prospect of automation of the labour-intensive parts of the design process came to be seen as basically an economically driven necessity. At the time, designers’ work included spending precious time elaborating on one or more versions of their own design concepts. The whole process, from conception to presentation, including variations, could take anything from days to weeks. Automation could therefore mean the saving of costly man-hours. To large design agencies it would mean even more, as they usually had in-house art departments where art-workers worked out the ideas developed by the design teams. One such agency was Total Design (TD from here on), that soon after its founding in 1963 had established a strong position as one of the leading design agencies with their businesslike approach and rational, modernist, design philosophy. This hegemony, however, placed TD in a vulnerable position: by the mid 1970s a new generation of designers considered the agency as a representative of the establishment, of a “cold and emotionless design” and made it a subject of ridicule. In addition Wim Crouwel, one of the agency’s founders left in 1980 to become lecturer at the Technical University of Delft and could no longer function as the charismatic spearhead the agency could rely on. One which the agency particularly needed at that time, when, in the wake of the economic downturn due to the oil crisis, it was no longer getting big house-style commissions, was caught up in internal wrangling and was apparently not succeeding in improving internal management despite various reorganization schemes (Bakker, 2011, pp. 279-282). It was in this period of upheaval that graphic designer Jelle van der Toorn Vrijthoff (born 1946) was asked to join the management board of Total Design with the challenging task of rescuing the agency from the brink of disaster and propelling it into a new era. His approach was to bridge the gap between what were then two divergent worlds: designing and automation. In the eyes of Van der Toorn Vrijthoff the graphic design process is not different from that of industrial design and architecture. What they have in common is working in stages, whereby the lion’s share of creativity happens in the initial stage. As the stages progress, the creative work gives way to pragmatism and execution of the task at hand. Much of the work in this last stage, is suitable for automation. Van der Toorn Vrijthoff was chosen because of his rational and businesslike approach as well as his experience with automation. He had acquired this during the period he spent in London – after having graduated from the Royal Academy of Art in The Hague – to attend a graduate course in graphic design and visual communication at the Royal Academy of Art in London. Before he returned to the Netherlands in 1973 he completed a course of computer-aided design programming at the Imperial College of Science and Technology in London and worked as a science research fellow at the Experimental Cartography Unit. Although he already had a strong interest in technology, it was during his time at the Cartography Unit, where use of digital technology was advanced, that he developed his ideas on the automation of text lay-out. A few years after his return to The Hague, in 1976, he had the opportunity to put his ideas on automation into practice when he was asked to head the design department at Sdu (Staatsdrukkerij en -Uitgeverij) the Dutch Government Printing and Publishing House. Traditionally the design department of the Sdu functioned instrumentally to the printing and publishing units and in particular the print unit had already made progress in automation. The first challenge for Van der Toorn Vrijthoff was precisely to make two seemingly divergent worlds meet: those of printers and designers. Although Sdu employed highly competent staff, the mindset of the more practically minded printers was worlds apart from the mindset of the artistic designers. As head of the design department with knowledge of computerization, Van der Toorn Vrijthoff was able to communicate with the two, until then, incompatible worlds at Sdu and his first priority was to harmonize the different disciplines. Director Hein van Haaren, whose job it was to modernize Sdu, backed him all the way and in a short period of time they turned the department into an independent design agency with the entire public sector as potential clients (Heijningen, 1988). At Sdu, aided by an experienced group of programmers, Van der Toorn Vrijthoff could continue the research he had begun in London into automation of layout work. Van der Toorn Vrijthoff worked with Sdu for six years when in 1982 he took on the challenge to direct Total Design into the world of computerized design. My experience at Sdu came in very handy. I started with the secretarial department and replaced all the old typewriters with word processors. Furthermore, we swiftly started investigating the possibility of applying typesetting and cartographic systems that were already available in the design process. At the end of 1982, while at TD, busy researching the available technology, Van der Toorn Vrijthoff received a phone call from Dominique Claessens. The director of Claessens Product Consultants approached various designers and agencies to ask if they were interested in a system for computer-driven design. He wanted to collaborate with designers to further develop his prototype of a computer-aided design system, but was consistently rejected. The offer came at the right time and under the right conditions for Van der Toorn Vrijthoff. They quickly agreed that Total Design could have the use of an Aesthedes design computer on condition that the designers shared their experience with the developers. Claessens and his men could use the feedback to improve the Aesthedes and should Total Design decide to purchase the computer system, the design agency would get a good discount on the sales price. Fig. 4 – Aesthedes computer, picture from a sales brochure, 1980s / Personal collection of the author. The name “Aesthedes” is a combination of the words “aesthetic” and “design”. This CAD system was specially designed to computerize time-consuming and manual technical drawing aspects of the design process. The case of the Aesthedes describes a remarkable episode in the digitalization of the design work. As he recounted in a booklet published many years later, to mark the winning of the “Gravisie Award 1984” (Claessens, 1986), Claessens had realized as early as the mid-1970s that the computer could fulfil an important need: to produce a variety of different concept designs at great speed. Throughout the 1970s the staff at Claessens Product Consultants had looked at the range of machines and technology available at the time and concluded that none of them met requirements or fulfilled current wishes of the designers. Their research did, however, result in an unequivocal understanding of requirements: the quality of the system had to be on a par with that of designs created by hand. The system had to be user friendly for designers and it had to be geared to the pre-press activities of the printers. At the start of the 1980s the company began developing its own design computer – which “even the biggest computer manufacturer could be proud of”, according to an enthusiastic Dominique Claessens (Kreyfelt, 1985). The project was driven by the understanding that designers were not inclined towards programming and should not be burdened with the necessity of learning programming codes – after all, that would inhibit intuition and stand in the way of the creative process. So one main aim was to make the computer user friendly for designers, therefore operating the device was simplified by displaying visually recognizable function keys on the operating panel, such as a drawing surface, a paintbrush, a ruler, an eraser, a glue pot and suchlike. There were three colour screens above the control panel (figure 4) the left-hand screen showed a close-up, the middle screen showed the entire picture and the right-hand screen showed the layer that was being worked on at that particular moment. Output can be sent to a plotter (drawing or cutting), a printer, a camera recorder and similar peripherals. The Aesthedes had a very powerful working memory for a computer in those days, with 1,9 Mbyte RAM and 2,4 Mbyte Graphic Memory and could process imagery with a higher resolution than what was visible on screen and in greater detail than a printing press was capable of producing. But the most important quality was that it could take a single concept and develop several variations with great ease. It could therefore automate an important part of the most labour-intensive aspect of the design process. Claessens immediately saw the potential of introducing the Aesthedes to a wider audience and, as mentioned above, he began contacting various agencies so they could jointly explore technological possibilities. The overriding response was extreme caution and pessimism, and the majority expressed concern that computerization would impede creativity (Claessens, 1986 p.12) or even that the job of the designer would become obsolete because of computers. Jelle van der Toorn Vrijthoff and TD thought otherwise and came on board. In the course of a year a couple of designers from TD moved from time to time to Claessens’ offices in Hilversum to experiment with the Aesthedes whilst being observed and questioned about the use of the machine. Finally, at the end of 1983, the first Aesthedes computer was installed at the Total Design offices in Amsterdam where in the meantime Van der Toorn Vrijthoff had prepared the design agency for its arrival. The Aesthedes initially arrived with specialized operators, but it was anticipated that staff at TD would learn through use to operate the device themselves in the near future. Although some designers were less enthusiastic and had reservations about using the computer, the new technology launched the agency into a new era in one swoop. This did not come without a price: despite getting a discount for helping with development the agency paid an exorbitant sum: 300,000 Dutch guilders for just one computer (this equals approximately 250,000 euros today). By comparison, the most expensive device the average design agency would have had around that time would have been a vertical camera set-up costing about 20,000 Dutch guilders (approx. 17,000 euros today). The fact that a single computer cost as much as a Maserati was a good reason for some to be skeptical. Beside this, according to what Ben Bos – then also a member of TD’s management board – reported afterwards, the Aesthedes provided a great number of options the designers and operators were able to expertly explore in the first few years but the computer’s downside was that the output quickly became outdated as people gradually became more adept at the tricks of the computer trade. TD became embroiled in animated internal discussions about using the computer. Van der Toorn Vrijthoff believed that the Aesthedes technology would give TD a big advantage over other agencies, so much that they would no longer need as many staff. This efficiency-driven attitude created a conflict between him and designers at TD. Some believed that the designs produced by the Aesthedes were similar to those of the popular Spirograph children’s toy. The major accusation was, however, that clever things were being drawn but they were being created without a shred of talent. Although the Aesthedes almost led to a rift within the agency in the first few months, they purchased two more Aesthedes computer systems one year later. The computer had such great potential and required such skill to operate it properly that it was more efficient to train one or two computer operators to fully optimize working with the machine. The combination of operator and designer meant that they could get the most out of the computer, which turned out to be quite substantial. The three Aesthedes computers were in a separate darkened room and we all worked in another large room. Initially I was only allowed a cursory glance at them because they cost 300 guilders an hour to use and in addition you had to take the operator into account. It took quite a while before I could think in computer terms and at first I felt out of my depth and found it difficult to translate what I wanted to make. You had to give the operator a clear description, but even that had to be systematically constructed. As a designer you’re more inclined to work intuitively, make changes fast, or even to start again from scratch. And that wasn’t possible. I remember getting so frustrated I grabbed a transparency and stuck it on the computer screen, then pencilled in how I wanted the design to look so at least I could explain what I was trying to create. It worked. To work systematically on that computer you had to envisage the end result and reverse the process. Unlike now, in those days you had to think everything through first and sketch it out step by step. You had to have completed the conceptual process before you started. That’s totally the opposite nowadays because you can usually sketch directly on the computer. Van Rixtel considers the design for Enter Foundation as a manifest of the new era with the Aesthedes. This word image shown in figure 5, was built up by a grid with five different elements that are interconnected, the word ENTER was written underneath. Even though working with elements was typical for this period, the Aesthedes made it easier to handle the elements and keep them on a tight grid. 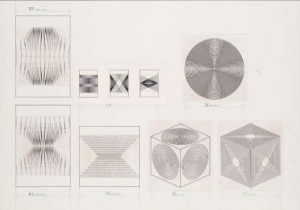 Five variations for other printed matter were realized by omitting each one of the five elements, an operation that was easily performed with the Aesthedes because of the structured way in which the computer functioned. Fig. 5 – Total Design, Enter logo, 1987 / Courtesy Robert van Rixtel, Eindhoven. The Aesthedes could elaborate on concepts that were impossible to produce manually. It drew perfect curves, which could then easily be modified. A lot of the designs from this period featured a surprising number of oval shapes, which are difficult to draw by hand but were a piece of cake for the design computer. Fig. 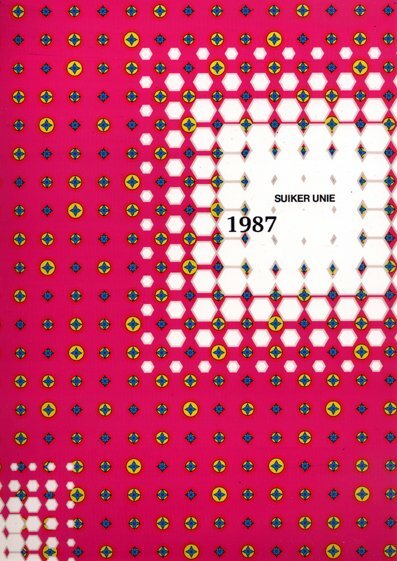 6 – Total Design, Suikerunie annual report 1987, 1988 / Courtesy Wim Crouwel Institute, Amsterdam. To his opinion a design as shown in the annual report for the Dutch Sugar Union (figure 6) would never have been made without the disposal of Aesthedes design computer. A closer look at two portfolio books that were issued in 1988 and 1989 at the occassion of TD’s 25th jubilee, presented in figure 7 and 8 shows various projects that were carried out with the Aesthedes (figure 8 in particular shows the design for a stamp; the publication has a remarkable atypical form due to the obliquely cut edges). Even the design for the books were realized on the design computer and the frequent use of curves, dots and diagonals throughout the publication is evident. Fig. 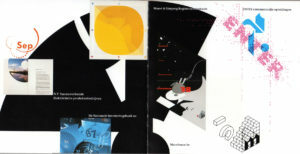 7 – Total Design, Total Design 25 years, anniversary publication, 1988, spread / Personal collection of the author. Fig. 8 – Total Design, Design: Total Design, 1989, spread / Personal collection of the author. Eventually, Total Design did not reap the financial benefits it expected from computerization, and which it badly needed. However, with hindsight, Van der Toorn Vrijthoff does not regard purchasing the Aesthedes as a bad investment, despite the well-known financial difficulties that dogged the agency in the 1980s, partially due to buying three Aesthedes computers. “Having a design computer”, he reflects now, “gave the agency kudos and boosted its image as a modern, up-to-date design agency”. Despite all the effort that Claessens had put into the propagating of the Aesthedes the prospect of this computer took an unfortunate twist when, not long after Total Design had bought their Aesthedes, the Apple Macintosh was rolled out onto the market. This handy small computer with a user friendly interface and software soon took over the graphic design sector. Some designers continued working with the Aesthedes alongside the Apple computers. At the end of the decade, Total Design migrated to using only Apple. Van der Toorn Vrijthoff remembers that Total Design scrapped the three old Aesthedes computers in 1990 and the machines were put out on the street for collection by the bulky waste service. Texts currently produced by most computers are an abomination from a graphic design perspective, with typefaces that are very unpleasant to read. Page layout is strange and unclear and it’s no wonder people get a headache from reading. All the typefaces are designed by engineers who don’t have a clue about graphic design. It’s about time a graphic expert is called in. In the case of the Sdu the Aesthedes proved to be a sound investment: adopted for the design of security documents to protect them against forgery, the computer considerably speeded up the design process and yielded a return on their investment after just three years (Middendorp, 2002, pp. 128-129). Claessens approached several other agencies in the Netherlands including Vorm Vijf and Tel Design in The Hague. Andrew Fallon, one of the partners at Tel Design, remembers a demonstration of the Aesthedes computer, in which Van der Toorn Vrijthoff showed how it could enlarge an image on the screen from one millimetre to one kilometre. Despite being impressed by the technological possibilities the computer had to offer, the partners at Tel Design agreed it was too expensive, especially bearing in mind that the Aesthedes only functioned optimally as a full set of equipment and with a trained operator to boot. Moreover, the fact that it could not process text well was a significant disadvantage. Tel Design had no pressing need to purchase their own Aesthedes because on the few occasions it could be of use, the design computer at the Sdu was available to them. Overall, while in the case of the Sdu the Aesthedes could meet technical requirements, it was too advanced and too difficult to use for most design agencies and certainly too expensive. Claessens’ assumption was that the Aesthedes would give the designer more freedom for creative work by automating routine operations, but ultimately the computer could not fulfil the promise of being “designer friendly”. In the end it could not compete with other equipments that began to make their way into the market and address designers. 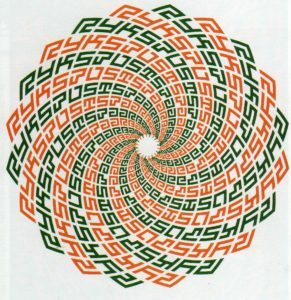 The story of the Aesthedes tells of a first attempt to equip designers with control over digital technology; the design computer provided a functional answer to the development of automation and digitalization of graphic design that started unfolding in the 1970s. The computer was designed in accordance with standards that applied to traditional mainframe computers and therefore needed, despite all efforts to design a “designer friendly device”, fully trained operators to control it. The tragic fate of the Aesthedes was that, despite its qualities, the arrival of Apple Macintosh totally vanquished it at one blow. The Mac did not have the considerable limitations of the Aesthedes regarding text and available software. What is more, the Mac was user friendly and, equally important, even though it was priced around 25,000 guilders (approx. 20,000 euros today), it cost a fraction of the Aesthedes. Another design agency in The Hague, Vorm Vijf, also had no interest in the purchase of the Aesthedes because it had already acquired its own microcomputer. Vorm Vijf is mentioned in literature as being the first Dutch design agency to start using the Apple Macintosh in the mid 1980s (Middendorp, 2002). Vorm Vijf closely followed developments on the minicomputer side. At that time Vorm Vijf, along with many other agencies in The Hague, had an important partnership with the press and publicity marketing department of the PTT. It was this contact that gave designers at Vorm Vijf access to the latest technology and possibilities. One of the advantages the Mac offered was that it came with a printer at the wonderful all-inclusive price of 40,000 guilders. Another advantage was the availability of other software for the Apple, unlike the Aesthedes where all its own software was pre-installed and not compatible with software from other suppliers. The new personal computers did more than just automating the labour-intensive aspects of the work, they influenced the conceptual side of graphic design, making it easier to elaborate on complex ideas, such as rounding a text, therefore eliminating any practical barriers when executing certain concepts. It should be noted, however, that the freedom this new tool opened up was cautiously used at Vorm Vijf. Looking back at those early days, Ridder described them as being adventurous: “Anything was possible but it was not always aesthetically pleasing”. Vorm Vijf treasured aesthetic purity in their designs and it was therefore a rule that letterforms should be respected; designers were not allowed to use the computer to distort type “under penalty of caning”. By the end of the 1970s there were almost ninety design agencies in the Netherlands designing logos, corporate identities, house styles and signposting for government and the business community, most still aligned with modernist design. At the same time, however, a fresh generation of designers was graduating who, in tune with the pervading atmosphere of anarchy, punk, and counterculture, soon rebelled against the prevailing culture of the overly dominant large design agencies. 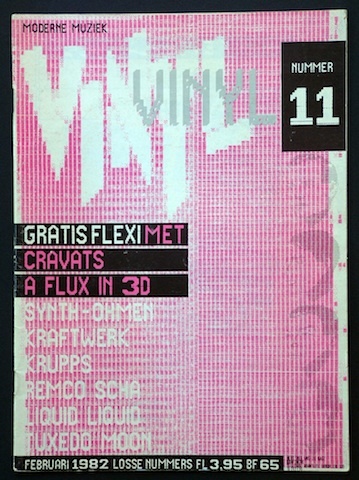 And, unlike Vorm Vijf, the younger designers had no qualms about distorting typefaces or images. I bought the ZX Spectrum so I could actually learn the ins and outs of a computer. I was able to transfer the built-in typefaces to another place by using the memory, and so modify and change and print them. I learnt what making italics and bold entailed in the typesetting machines, it was simply placing pixels next to each other or moving them around (Frederiks, 2012, p. 9). Kismans design for Vinyl (a magazine for alternative music, shown in figure 9) illustrates how he represents a new generation that shows a new approach to graphic design. A generation who explored the boundaries of the computer, developed a new visual language and embraced the opportunities that technology created to express their own creativity. The desktop computers brought the opportunity to work directly with the device, without the mediation of an operator or technician. The wide availability of software and print devices that quickly succeeded, led to the independence from artworkers, typesetters, lithographers, printers and even publishers, professions that had for years played a part in the creative process of the designer. In the second half of the 1980s designers obtained a new freedom, by using the desktop computer they could independently realize any idea, from concept to print. Fig. 9 – Max Kisman, Vinyl, 11, 1982/ © Max Kisman. The cases discussed show that the designers’ relationship with and attitudes towards the computer changed over time, and only by examining all the steps in the development can we begin to understand these changes – and the impact of the “digital revolution” that was caused by the introduction of the Mac – in depth. If we examine the introduction of the Apple Macintosh not as the beginning of a revolution but as a step in a series of developments, we begin to recognize a transition in design as a reaction to the computer, to designs for the computer, to designing with the computer. This article supports the conception that computer technology already played a role in the design practice during the 1960-1980s although, as the story of the Aesthedes computer and the examples discussed prove, in different roles. The computer exerted influence on the design process, first as a source of inspiration and phenomenom of modernity, subsequently as an automated production aid and instrument for the production of complex ideas. The fate of the Aesthedes was that it could not fulfil the promise of being “designer friendly” and the machine was too costly to be able to gain a large market share and thus genuinely become influential in design practice. When a new generation of designers entered the profession in the 1980s computers were no longer regarded as the expression of a modernist and rationalist attitude, as they had been in the eyes of such designers as Wim Crouwel, Ootje Oxenaar, Jurriaan Schrofer. They were not concerned with the issues of automation and workflow that had preoccupied big agencies like Total Design, the Sdu and Vorm Vijf and, unlike Vorm Vijf, they had no qualms about distorting typefaces or images. It was the combination of this fresh approach to the design practice and the launch of the easy-to-use desktop computer that allowed young designers to find their own visual language, which caused such a marked transition in designing with the computer in 1984. The author wishes to thank the reviewers and editors for their valuable comments and suggestions on previous versions of this paper. Bakker, W., & Bram, K. (2011). Droom van helderheid: huisstijlen, ontwerpbureaus en modernisme in Nederland, 1960-1975. Rotterdam: Uitgeverij 010. Broos, K., & Hefting, P. (1999). Grafische vormgeving in Nederland: een eeuw. Alphen aan den Rijn: Atrium. Claessens, D. P. G. (1986). Aesthedes, een computergestuurd vormgeversgereedschap: winnaar van de Gravisieprijs 1984. Utrecht: Van Boekhoven-Bosch. Frederiks, H. (2012). In mijn werk zit meer gevoel dan ik zelf wil prijsgeven. Dzone, 142, 8-14. Heerhugowaard: Hollandia Publishing. Fritz, D. (2011). Mapping the Beginnings of Computer-Generated Art in the Netherlands. 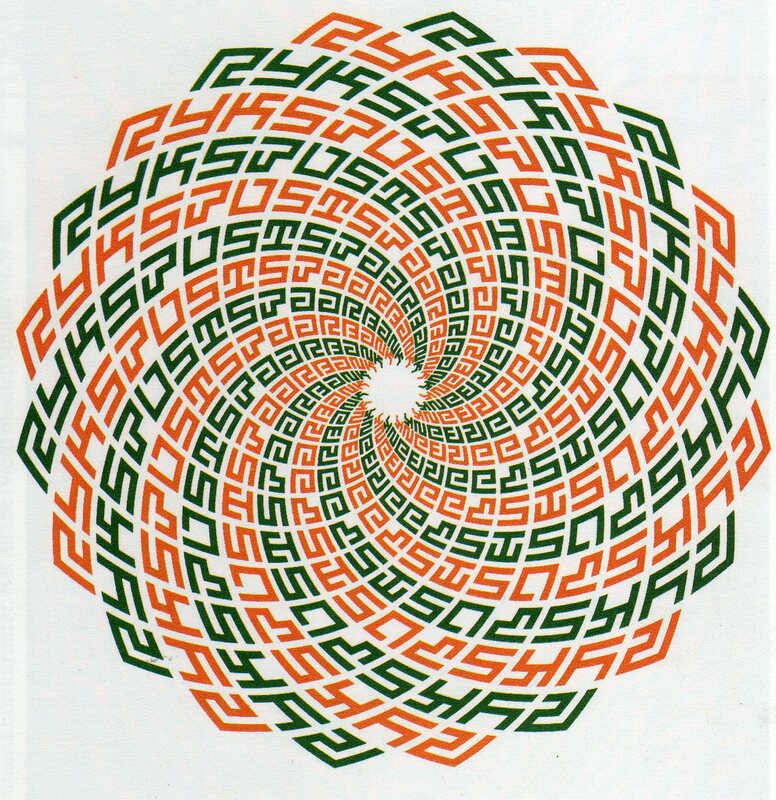 Retrieved from: http://darkofritz.net/text/DARKO_FRITZ_NL_COMP_ART_n.pdf (accessed December 10, 2012). Heijningen, L. A. van. (1988). Sdu, De eerste vier eeuwen…: drukken, uitgeven en vormgeven voor en na privatisering. ’s-Gravenhage: SDU. Hubben, H. (1989). Ontwerp: Total Design: de jaren tachtig. Wormer: Inmerc. Huygen, F., Sybrand Z., & Haaren, H. van. (2009). Hein van Haaren. Eindhoven: [Z]OO producties. Huygen, F. (2013). Jurriaan Schrofer: grafisch ontwerper, fotoboekenpionier, art director, docent, kunstbestuurder, omgevingskunstenaar, 1926-1990. Amsterdam: Valiz. Huygen, F., & Boekraad, H. C. (1997). Wim Crouwel: mode en module. Rotterdam: Uitgeverij 010 / Amsterdam: Stedelijk Museum. Kreyfelt, M. von. (1985). Say what you want. I can make it. Items, 17, 4, 4-9. Weesp: Openbaar Kunstbezit. Kuijpers, E., & Brinkman, E. (2011). R. D. E. (Ootje) Oxenaar: ontwerper + opdrachtgever. Rotterdam: Uitgeverij 010. Middendorp, J. (2002). Ha, daar gaat er een van mij! : kroniek van het grafisch ontwerpen in Den Haag 1945-2000. Rotterdam: Stroom HCBK / Uitgeverij 010. Molenkamp, M., & Bavelaar, H. (2010). De stijl van het Rijk: de visuele identiteit van de Rijksoverheid. Den Haag: Ministerie van Algemene Zaken. Poynor, R. (2003). No More Rules: Graphic Design and Postmodernism. New Haven, CT: Yale University Press. Schreuders, P. (1997). Lay in, lay out. Amsterdam: Gerrit Jan Thiemefonds. Staal, G., & Wolters, H. (1987). Holland in vorm: vormgeving in Nederland 1945-1987. ’s-Gravenhage: Stichting Holland in Vorm /Amsterdam: Stedelijk Museum. The examples discussed in this article are based on literature. The general surveys of Staal and Wolters (1987) and Broos and Hefting (1993) offered a starting point and both Molenkamp and Bavelaar (2010) and Middendorp (2002) offer valuable insight in the significant role played by the government as a commissioning body. Heijningen (1988) describes in detail the technological and organizational developments at the Government-owned design and publishing house Sdu. Besides the aforementioned publications, the monographs on Ootje Oxenaar (Kuypers, 2011), Wim Crouwel (Huygen, 2015) and Jurriaan Schrofer (Huygen, 2014), along with their archives – with which I became familiar while working at the Dutch Archives of Graphic Designers (NAGO) – offered additional insight. The archives of Ootje Oxenaar and Jurriaan Schrofer are kept at the Special Collections department of the Library of the University of Amsterdam, the archives of Wim Crouwel are kept at the Stedelijk Museum Amsterdam. The www.nago.nl and http://www.wimcrouwelinstituut.nl/nago/ websites help finding information and access to all of these archives.